With its original design and different architectural perspective providing easy access to passengers, Ankara Esenboğa Airport symbolizes Ankara's new and contemporary face. 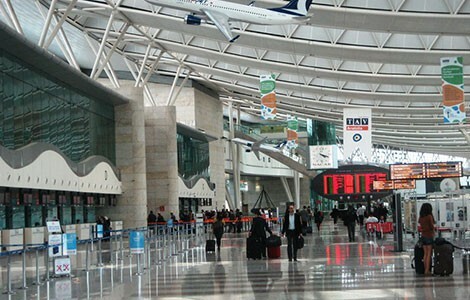 Selected as "Best Airport” at the category of "5-10 million passengers" by ACI Europe in 2009, Ankara Esenboğa Airport has a strategic significance as being our country's protocol and diplomacy gate. With its increasing number of passengers each year, modern architecture and effective advertising spaces Esenboğa Airport provides effective promotion opportunities for advertisers. Approximately 260 airplanes land on and take off from this airport serving to approximately 30 thousand passengers every day. PORTLINE with its 2 CLP Networks having 80 faces located at domestic and international terminals of Esenboğa Airport and billboards placed at most visible spots of the airport responds to different needs of advertisers.